What a Christmas present — it’s 35 degrees today! After a week of very cold weather, today is a gift like no other. We’ve been busy enjoying it to the fullest. Will had one of our old tractors way over at one of our rented hayfields. While loading a big round bale, it just plain quit and wouldn’t start. As it was getting dark, Will came home. Then it got cold and working on it was out of the question, especially because it’s a diesel. So with the warm day, Will drove over there, tools in the truck. I’ll admit I prayed a lot for God to send diesel mechanic angels to help out. And when I drove out to mail some Christmas cards, there came the tractor with a round bale on the front spears! Thank you! Thank you! I did extra chores this morning. I fixed the chicken feeder, which had come loose from the chain it had been hung on, cleaned the goat pen and fluffed up their new bedding. 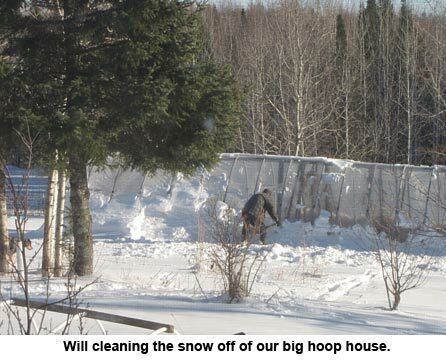 Meanwhile, Will took the scoop shovel and went out to clean the heavy snow off our big hoop house. (Friends of ours had their big, new high tunnel collapse during that first two feet of snow we got early in the winter.) So far, the 6 mil greenhouse plastic is holding up very well; this is its second winter. We’re looking at the radar map and cringing. They’re calling for a heavy, nasty winter storm for Christmas Day here. But we’ll wait and see. Often the weather swings south of us and we don’t get what is predicted. We finally got our owl puzzle finished and are missing one piece. Our cat, Mittens, LOVES to pick up small things and trot off with them or else take a paw and shove them onto the floor. And Ashley’s dog, Cooper, will eat just about anything. So we’re not sure where the missing piece went. But I’ve had that happen before and am just going to cut out a similarly colored piece to glue in that spot. You’ll never see it when the puzzle is glued to the plywood. Thanks all of you for your Christmas messages. Due to icy, foul weather, only our nearby family came for Christmas. But it was still peaceful and nice. Now, thinking on to Spring…..! Merry Christmas and happy New year! We had TONS of rain yesterday starting off pretty icy, then thunderstorms, now gale force winds with temps dropping! Hopefully your weather is less surprising and the family was able to get together to celebrate! Thank you for all the great advice throughout the year(s)! Merry Christmas to Jackie and Will and family. Been a reader for many years, this is my favorite blog. Hope you have all have a safe and happy New Year with no breakdowns and plenty of firewood. Jackie, praying your day is filled with CHRISTmas love and have a blessed New Year. Jackie and Will, thank you for keeping it real. You guys are two energizer bunnies. Merry Christmas and Happy New Year to one of my favorite bloggers. By the way,I check your weather report regularly. Here in north Georgia, it’s going to be in the seventies (about 30 to 35 degrees warmer than usual). Hey I never heard of that. I will sure give it a try. Thanks for the info. I’ve heard that you can write the puzzle manufacturer and request a missing piece, if it’s a recent puzzle. I guess you would take a photo of the almost completed puzzle so they would know which piece to send. Look for a website with a customer service “contact us” section online. It’s worth a shot. Merry Christmas to you and your family. Never a dull moment for Will and Jackie in Angora, Minnesota. You pioneers have kept me smiling all year long. Hearing about your lives uplifts me and I truly enjoy reading about your joys and your trials. You inspire so many of us with your energy and happy outlook. I shall never accomplish near what you have but I have enjoyed your posts which keep me going when I have a challenge or misfortune. If Jackie can do it, then by golly I can keep at it too. Everyday is a blessing and I give thanks for you both. Thank you for the Christmas greeting and for wonderful posts throughout the year. Your posts are like letters from an old friend. You always have something interesting or enlightening to say. Merry Christmas to you and have a very blessed 2017. Hurray for a break in the weather for you! Best wishes for a Merry Christmas! Merry Christmas, to you and your family, Jackie, and blessings of good health and prosperity in the coming New Year. Have a blessed Christmas, Jackie and Will and family! Your family putting together the puzzle brings back such good memories. My Mom loved to do puzzles. I usually picked them up at garage sales or thrift shops for her. After she completed the puzzle, she would glue it to a thin board, decoupage it, and then my Dad would make a frame for it. A little project they would do together. I have many picture puzzles hanging at my house! Both of my folks are gone now but what a blessing to have the great memories. I just got my Jan-Feb issue of Backwoods Home and want to tell you that your article was the most useful and complete I have read on the subject of Bugging out in place. Your experience in actually living the subject is outstanding. Thank you for sharing your knowledge. I also learned from Patrice Lewis’ article on Prioritizing preparedness.